Hair problems start below the scalps surface. Theis illustration of unhealthy hair signifies serveral problems. Dandruff on the scalp surface causes bacteria to form and penetrate the follicle. That, combined with impacted sebum and other debris (micropolluntants, chmical residues from commercial shampoos and other hair care products, etc.) builds up and hardens around the bulb. This causes atrophy and restricited nutrient flow to the papillary matrix. 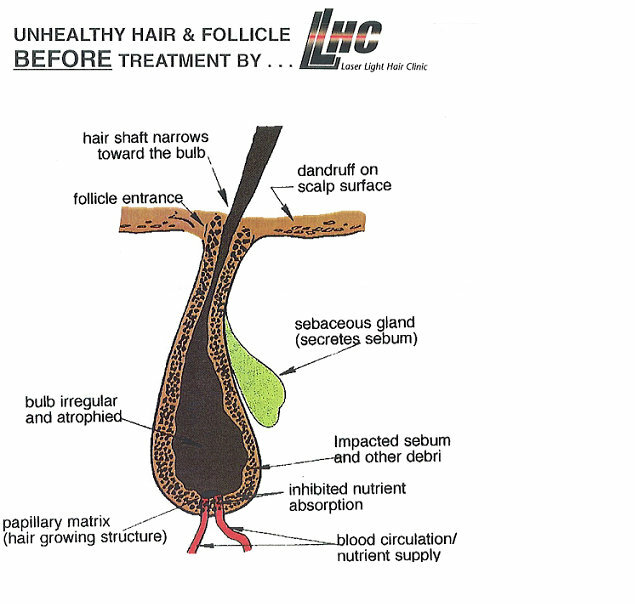 The result is a progressive deterioration of hair strenght, thickness and overall vitality, often leading to hair loss and eventual baldness.